One of my favorite Google tricks is site-specific searching. In other words, you run a Google search just like you usually would, but limit the scope to one site. Suppose, for instance, that you're trying to find an old post of mine--say, the one about using Gmail to filter spam. 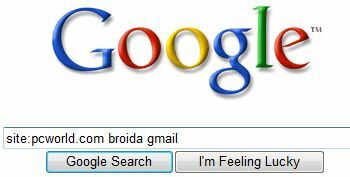 One option is to head to PC World, type in a few keywords, then wade through the results in hopes of finding the post. Get the idea? Just prefix any search with site: and the domain name, making sure to leave no space after the colon.